Take a break from the technological evolution of firearms and consider the collection’s magnificent works of art—the engraved pieces in the Robert W. Woodruff Embellished Gallery. This handsome space features the original oak woodwork from the Winchester factory offices in New Haven, Connecticut. Prominent in the Embellished Gallery is a premier Winchester Model 1866 Lever Action Deluxe Sporting Rifle, pictured below. It was engraved by Conrad Ulrich with classical hunting scenes in the Germanic style. The Roman goddess of the hunt, Diana, is depicted on the right side of the receiver pursuing a deer, while forward of the loading gate Ulrich engraved an elk. On the left side of the receiver Ulrich complemented this with another elk, a bison, and a grizzly bear. Steel Sculptures: Engraving individuality from mass production. Our newest addition to the Embellished Arms Gallery is an extraordinary collection of artistically embellished firearms. The Raymond Wielgus Collection transforms historic firearms into sculptures. Within this collection are original and reproduction firearms created by manufacturers such as Colt, Smith & Wesson, and Remington—all innovators and artists in their own right. Wielgus procured these mass-produced artifacts in order to enhance their artistic appeal. He selected a diverse range of significant firearms from “guns that won the West” to military arms. This collection includes a Wielgus embellished Volcanic pistol of the type that became the grandfather of Winchester’s lever action rifles. He also accented the Colt Model 1860 Army Revolver. 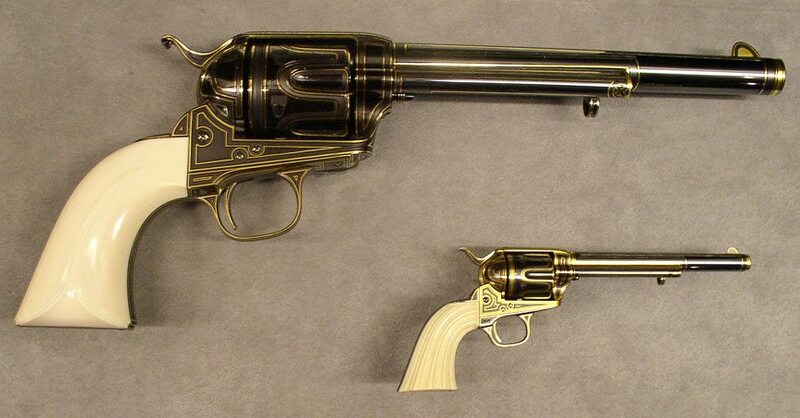 Soldiers of both armies used this revolver during the American Civil War. Wielgus beautified the Smith & Wesson Ladysmith to acknowledge the soaring popularity of firearms among women. Wielgus enriched history through his engraving processes of ivory, gold, and steel. He simultaneously inspired innovation for the future of firearms development and embellishment. Also on display in the Embellished Arms Gallery is a collection of presidential guns, including an extraordinary rifle that was presented to Ronald Reagan, the 40th president of the United States. The Winchester Model 64 Lever Action Rifle in .30-30 caliber was customized by firearms notable Frank Pachmayr and magnificently engraved by Master Engraver R. Boucher. 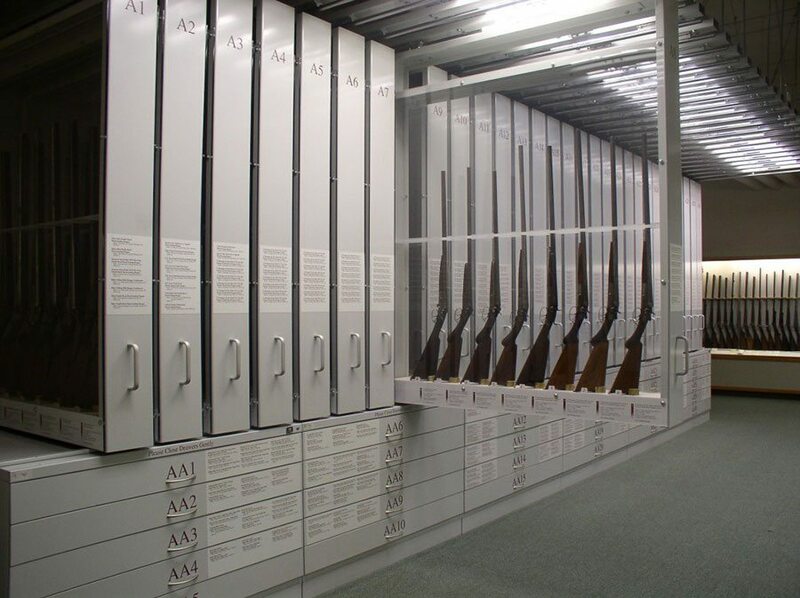 On the lower level of the Cody Firearms Museum is the Study Gallery that houses a large collection of firearms displaying the variations of sporting rifles and shotguns from around the world as well as a look at exhibition shooting. Take a look at our new high-density StabeArte display cases, giving you a look at both sides of the firearms they house.